During Test Preparation, the test engineer may want to specify the data configuration, the test procedure (optional), the report (optional) and perhaps a packaged test. In TALENT™, the generic configuration editor can be used to edit the test data configuration in a uniform manner. 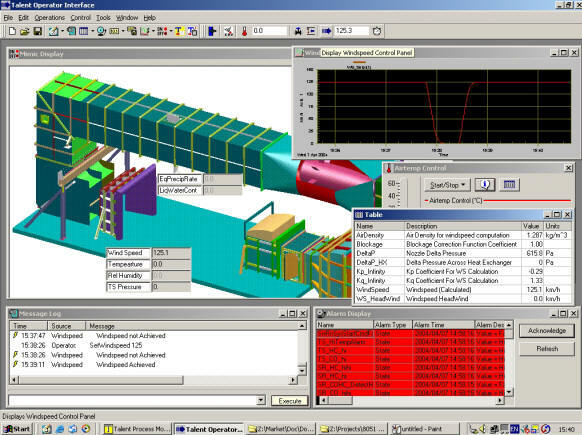 The basic editor enables the test engineer to specify data acquisition source, type (AI, frequency, etc. ), computations (temporal mean, temporal standard deviation, average of several parameters, or any VB script compatible expressions), recording specification, descriptive information, display defaults, monitoring alarm levels, etc. TALENT™ computes the data during run time using the most up-to-date channel and sensor calibrations for each parameter. The channels (I/O system hardware) and sensors calibration information / history are stored in data bases. Multiple data systems, multiple data recording sessions can coexist. The parameter properties are stored together in each data file to ensure that the test data is traceable. There are many tools in the configuration editor to simplify and facilitate the creation of a data configuration, e.g. 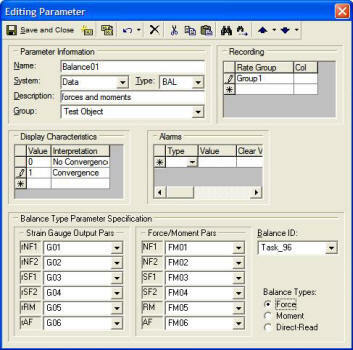 duplication of parameters (with auto fill using available channels), copy / paste / drag and drop parameter from existing configurations, exporting parameter specifications to Excel (and vice versa), sorting and printing configuration information for instrumentation checkout, etc. TAL is based on Microsoft VBA, the same macro language that is used to automate numerous desk top applications in Word, Excel, etc. 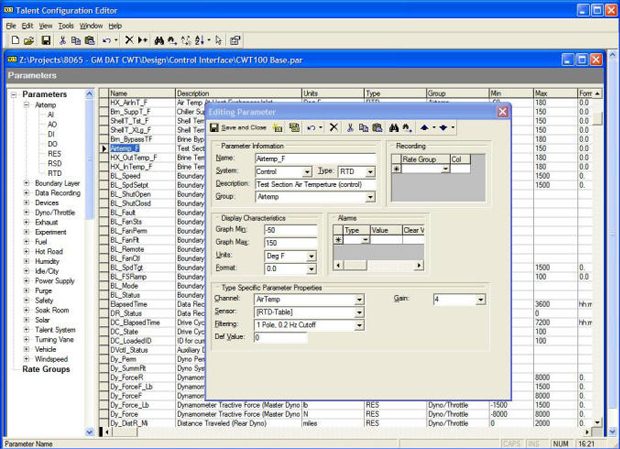 TAL has all of the VBA features and, in addition, can issue facility specific process control commands. TAL also has built-in real-time support such as timers, synchronization statements (e.g. WaitFor), and can access any facility or experiment data dynamically, or test properties (e.g. frontal area), for making decisions etc. TAL can be executed interactively (usually for step by step debugging only) or non-interactively. 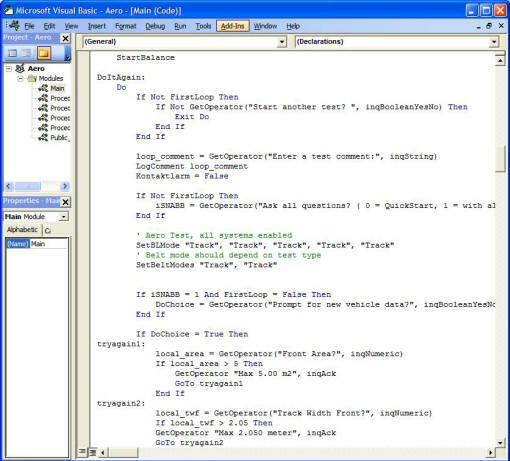 TAL is constructed in the Microsoft Integrated Design Environment (IDE), where arguments required to complete a statement will be displayed as the statement is being entered. Note that ReACT implements facility command and control using the "Objective Oriented Control" philosophy, from the test engineer's view. For example, the test engineer needs only to specify the wind speed target, there is no need to perform the pre-requisites such as turning on the auxiliaries, setting the wind speed control loop to auto, etc., these will be accomplished by the controller. TAL supports procedural execution (e.g., from statement to statement) as well as "rule-based" execution (implemented as classes). This rule-based capability can be used to continually monitor certain conditions, and automatically execute certain commands or sub-procedures upon occurrence of these conditions. TAL can also be used to support graphical specifications for procedures, e.g. by using Excel. ReACT can also supply customized facility simulators to enable development of automated procedures without using facility time. A complete test can be executed manually (operator specifying what configuration to use, what procedure to execute, etc. ), or automatically using a Test Definition, or semi-automatically using a Test Definition with an interactive Test Automation Language procedure. When a test is executed using a Test Definition, the TALENT™ Test Manager performs the required pre-test actions (loading the I/O configuration and loading the TAL procedure with the required run-time arguments, etc. ), and then starts the execution of the test procedure. All data systems will be informed to use the specified I/O configuration. The test information, e.g. test object properties, can be accessed by all modules, including the user's own data reduction task. 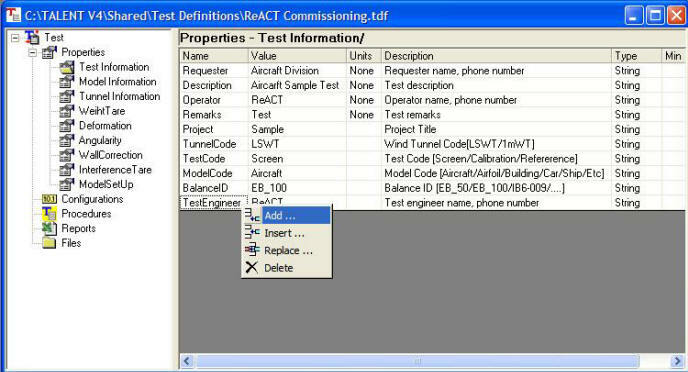 Once the test is complete, the Test Manager saves the test activity information, which can be used by the facility manager using the Test Explorer, and launches the report processing function. TALENT™ provides an intuitive Graphical User Interface (GUI) desk top for the operator to perform process control, display test data and manage test procedures and tests. The same GUI can be used for ad-hoc tests as well as pre-defined tests. The same GUI executes on the operator workstation, test engineer workstation, process control system, model support control system, data systems, etc. The list of Add-ins in each of these systems will be configured differently to appropriately tailor the functionality of each GUI. Any data can be displayed on any GUI at any time. TALENT™ GUI is a major departure from traditional Supervisory Control and Data Acquisition / Human Machine Interface (SCADA / HMI) systems, which cannot use dynamically configured experiment data for decision making (in procedures), or even for display. TALENT™ is also different from other data acquisition driven automation platforms in that it has full access to data from all dynamically configured distributed control and data systems through data sharing, not just a sub-group of hard coded data tags from specific machines. The use of Add-in technology allows the user to program specialized displays in the future without changing the basic system. For command and control, the operator can issue commands either through control panels or through a text command dialog box. In either case, the command is a text string that is interpreted and forwarded to the appropriate controller process. The text command is displayed in the GUI operator message window for information purposes. The information in the operator message window is time stamped and logged. The logging is object based, to enable the actual information displayed to the operator (i.e. not just text), to be retrieved later for operation analyses (see second image below). Commands to customized process controllers can be issued via control panels. Commands allow context sensitive commands to be passed. 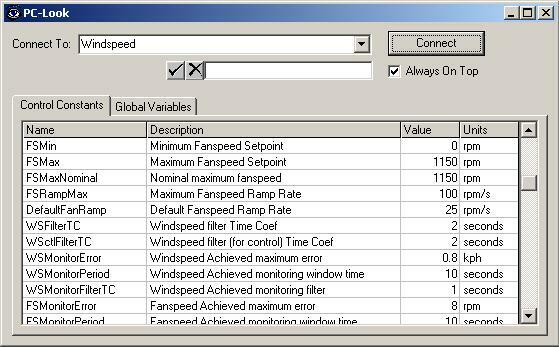 For example, in aerodynamic testing where temperature is not important as long as it is stable, the air temperature command can indicate the maximum intended wind speed instead of a specific temperature target, to enable the controller to intelligently decide the best temperature based on the cooling tower conditions and the expected fan power. 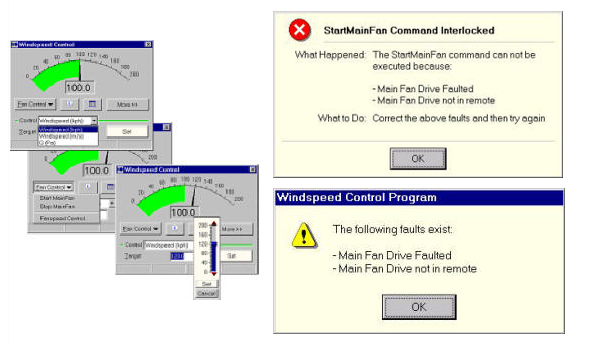 The customized process controllers also have built-in diagnostics to enable the operator to inquire about what went wrong and what to do when a command cannot be executed (see second image below), or when the operator inquire about what was wrong (see third image below). Using DirectX graphics, animated 3D control panels can also be added as Add-ins. Test data display and monitoring is supported via a variety of generic Add-ins, including table display, graph display, mimic display, etc. All data displays can be configured on-the-fly, and can be saved individually for later use, or saved with the desk top for use with specific test types. All data displays can be printed, or copied to Microsoft Office products such as Word, Excel, etc. to produce ad-hoc reports. Any data from any integrated system can be displayed on any computer at any time - there is no restriction on data from control or data systems. The table display allows the user to change fonts (size, etc. ), tag colours (for alarms, etc. ), select columns, and displays additional information such as raw counts, etc. The graph display allows the user to display up to 8 graphs on 4 axes, plot X-Y graphs, plot against history, change colours, add call outs (comments), and performs intelligent printing on B&W printers by converting colours to line types. Through Add-ins, TALENT™ GUI also supports custom developed COM objects, e.g. contour plots. Test data recording can be controlled in much the same way as process control, through control panels, operator commands, or test procedures. Multiple data systems and control panels can coexist, to record data synchronously from one's own source, and from other sources through data sharing. Each data acquisition system is responsible for computing the synthetics that have data sourced in that system, and synchronize the computation with the data samples that are acquired. Data recording can be continuous, single-shot, triggered, or pre-triggered (recording past data as well as on-going data when triggered by an event). 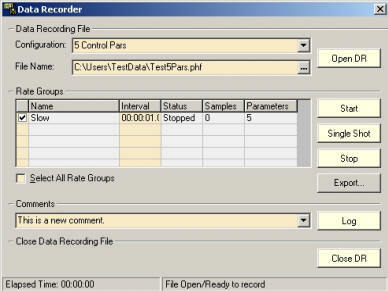 For general-purpose data recording (only), new parameters can be added during a recording session (there will be a short interruption to the recording during addition of parameter). 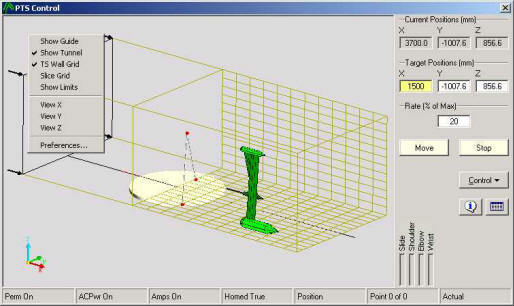 The operator can use the TAL Manager for loading, executing and monitoring TAL procedures used in automated testing. The TAL manager panel is a generic Add-in component that is used to communicate with the TAL Manager process. As an alternative to ad-hoc testing, the operator can also use the Test Manager panel, another GUI add-in, to execute a pre-defined Test Definition (packaged test). TALENT™ provides a set of functions that can assist in the management of the test facility. Alarm Monitoring - TALENT™ provides extensions to traditional alarms and annunciation. The alarms can be specified for both facility wide and test specific levels. Rule based monitoring with responses can be programmed in TAL procedures. Operation logging - The commands issued by the operator, and the responses from the controllers, are time-stamped and logged and can be audited to ensure that tests have been carried out correctly. Warnings from the controllers are logged as objects, so that the details can be retrieved later for analyses (see below). Facility Maintenance diagnostics - TALENT™ customized control systems are designed to report diagnostics results to the operator with comprehensive and informative text, including "what went wrong" and "what to do". 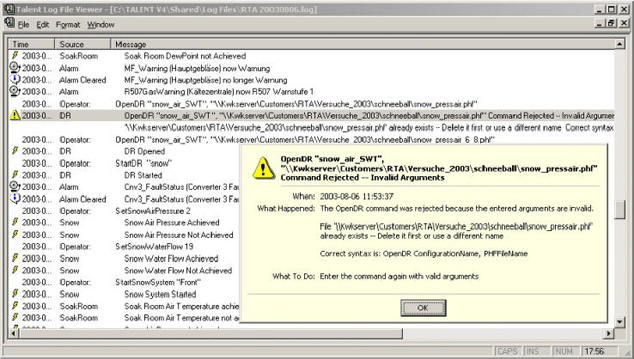 Such messages (with embedded objects) can be displayed to the operator, logged in a file for later analyses, or copied into documents to document any problems. In addition, a utility can be used to look into the internal operation of any distributed controller while it is running in real-time. It can also log the internal variables and I/O values at a specific operating point. This can be used to diagnose control problems. These maintenance diagnostic tools can be used for both local and remote maintenance. ReACT can provide maintenance contracts which will include technical support and remote access (via Internet) to diagnose and correct problems. Calibration - TALENT™ embeds calibration and calibration-check support in the I/O subsystem for both facility and experiment front-end channels (signal conditioning equipment) and sensors. 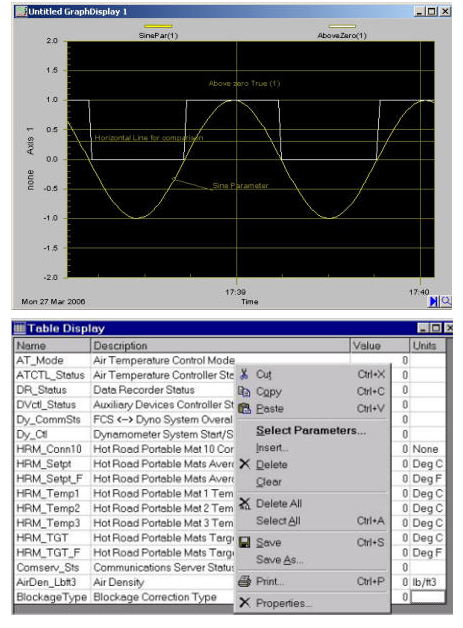 The calibration wizard can be used to guide the instrumentation technician step-by-step. 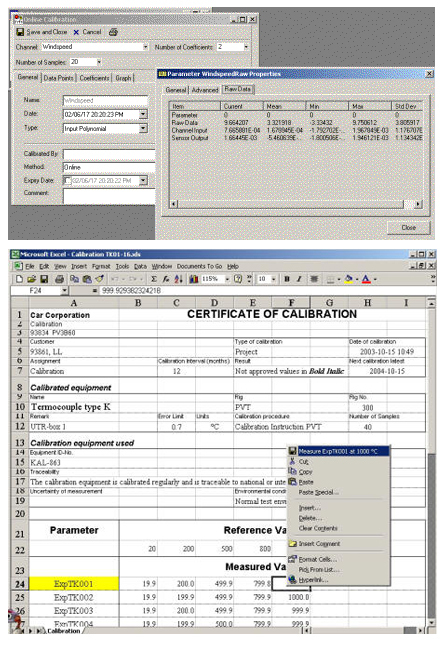 The calibration history is kept in a database for traceability and quality auditing (the latest valid calibration is used). The calibration-check worksheet can be used to produce a printed version of the check procedure. Multiple sensors of the same type can be calibrated together to save time. TALENT™ also supports automatic calibration (with external secondary standards) for certain I/O subsystems. Test Information Database - TALENT™ keeps the summary information of tests in a data base. The summary information can be configured as a subset of the facility specific Test Definition properties across all test types. The test information can be viewed using the Test Explorer. Usage Monitoring - TALENT™ can be configured to continuously log specified facility parameters, independent of test data recording, to provide availability and usage information. Customized reports on facility occupancy, equipment availability, facility parameter time history etc., can be supplied for analyses and invoicing purposes. The open software architecture allows custom or user written control systems, data acquisition control modules, or user interfaces to be integrated with the generic part of TALENT™. TALENT™ components (ActiveX EXE, DLL., OCX etc.) can be referenced by user software to provide customized functions. New control and data systems, provided they adhere to the TALENT™ standard, can be seamlessly integrated to the system at any time without modifying the base system.